That statement can be found on page 76 of the The Fat Flush Plan by Dr. Ann Louise Gittleman (which, red flag alert, promises to “melt fat… in two weeks”). The “reasoning” behind that piece of advice is that the combination of fruits and vegetables (or milk and meat) in the same meal slow down, or inhibit, the “fat flushing” process. This is a perfect example of inaccurate and impractical advice. The notion that adding tomatoes (a fruit), avocado (a fruit), sliced pear, or Granny Smith apple slices to a salad is detrimental to health is absolutely preposterous. If anything, adding a fruit rich in vitamin C to a salad is a wonderful way to increase iron absorption form dark leafy greens like kale and chard. I don’t understand why some nutrition and weight-loss authors (mostly those with very little knowledge of how the human body works) think our digestive systems are unequipped to digest different foods at once. These rules simply promote neurotic fanaticism at mealtime, and make mountains out of caves (forget molehills!). 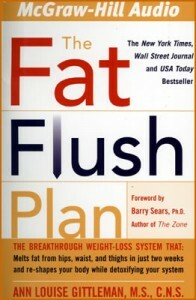 No Comments Ann Louise Gittleman, Fat Flush Plan, food combining, myths, Who Said It?